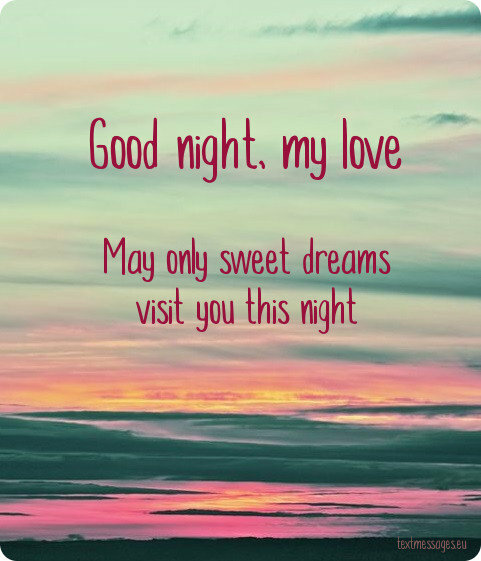 Surprise your sweetheart by sending her sweet good night text or card. 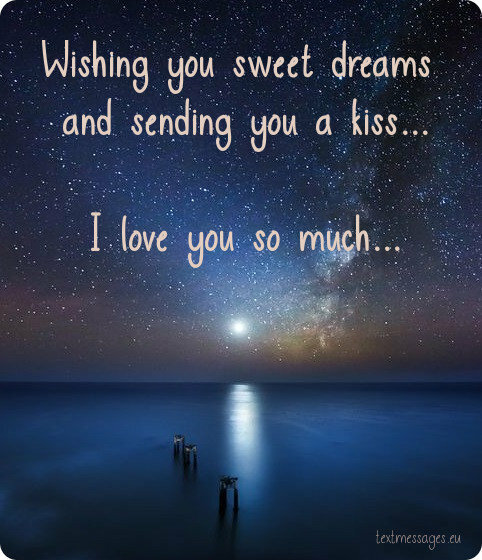 On this page we present you a large collection of good night messages for her with images that you can send to your girlfriend or wife. 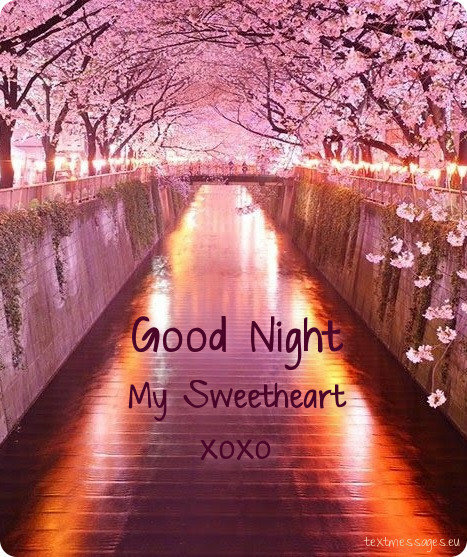 These cute good night wishes will bring the smile on her face and make her feel special. Hope that you will find the words that you like. It doesn’t matter how bright and wonderful my dreams are, because they still can’t compare to these sweet moments when I’m with you. I can’t wait to wake up and see you again. Good night, darling. Although I can‘t be together with you but I hug you very strong. I will be near you in your dreams. We will meet there! Some scientists say that star Sirius is the brightest star in the night sky. I don’ t agree with them. The brightest stars I’ve ever seen were your beautiful eyes. Sleep tight, honey. This night is so quiet and there are so many stars in the sky… I’m standing near the window and thinking about the past times when people used stars to find their way. But you know, I don’t need any stars, because the only guiding star for me is you. Nothing can compare to your incredible beauty: neither the light of a thousand stars, nor the moonlight. You are the most wonderful creature in the whole Universe and I love you endlessly. Good night, my love. The most cherished dream of mine is to appear in your dreams and make them really sweet and pleasant. Sleep well at night and gain strength, because an amazing day is waiting for us! So that your sweetest dreams come true. Good night, honey, sleep tight! I’ve been thinking about you all day. And it seems to me that I won’t stop doing it even at night. 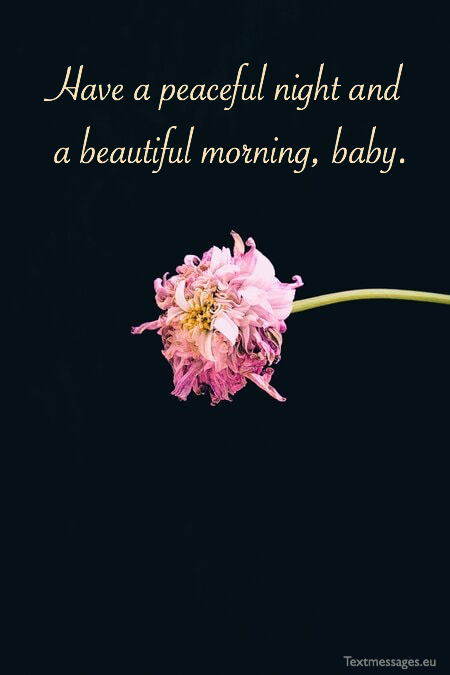 I recall your angel face, big blue eyes and tender voice… Honey, you are perfect to me. Wish you to have the most amazing dreams this night. I couldn’t sleep since I met you. And now I’m lying awake and thinking about you. Again. Baby, you drive me crazy. Although I expect reciprocity, your precious sleep is more important to me, so sleep tight. Although we are miles away, I still can imagine you lying next to me and breathing quietly. You’re so beautiful and peaceful when you sleep. Send you lots of hugs and kisses. Sleep well. Night follows day, the moon gets bigger, even the stars change their positions. Everything changes in this mutable world, but not my love for you. It was, is and forever will be the same. Sleep well, my princess. I wish I had an opportunity to show you the most wonderful dreams. I wish I had an opportunity to warm you up every time you get cold at night. Sleep well, my sweet princess. May this night take away all your heavy and disturbing thoughts and show you many bright and wonderful dreams where we are together. Wish you a good night, my dear. My sweetheart, I wish you to get a good rest and fulfil with energy for the whole day. Sleep well and don’t worry about a thing – I’ll guard your sleep and make all your nightmares go away. May this wonderful night give you a wonderful adventure to the places where you’ll become happy. And I’ll take care of your happiness when you wake up. Good night, honey. My love, I always admired you! You manage to do so many things during the day and I’m really proud of you. But let yourself get some rest this night. Sleep well and don’t worry about a thing. Good Night Love!! I fall asleep every night with a big smile on my face because I am sure that when I wake up I am going to meet the person who puts it there. I literally just can’t describe, how I feel. Remember that the night is not forever, but our love definitely is. Have a good night sleep. Let me tell you the reason why moon is shining so bright tonight? It is due to the fact that it is trying to be as beautiful as you are. Have a lovely and awesome night. Good Night and Sweet Dreams my lovely girlfriend/wife. This message is definitely a guarantee that you’ll have awesome dreams and will wake up with a SMILE on your face. May the stars sing you a lullaby of love this night and may the moon guard your sleep! Sleep well, sweetheart. Sweet dreams love!! Even though thousands of stars shine bright in the sky. But, you’re the one and only shining star of my life. You are the one and only who can light my nights up. Now, the moon is jealous of you and angry at me. Good Night Love! This quote has the following attachment. The cosiest hug, sweetest kiss, the cutest cuddle and warmest snuggle. Good night and sleep tight. 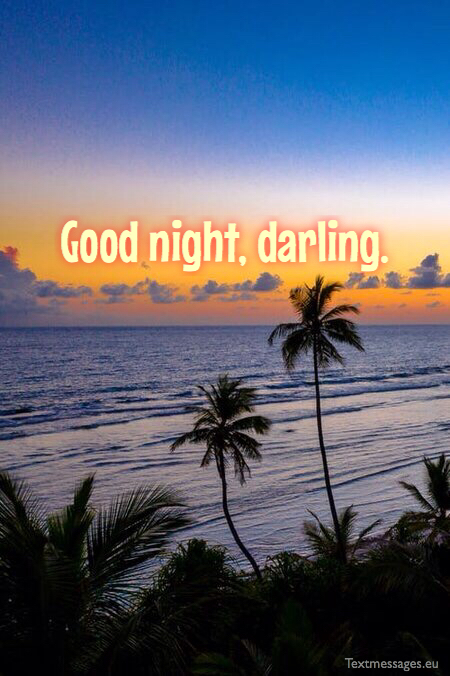 My darling, I wish you to sleep well this night and prepare for an exciting day. May only sweet dreams visit you this night and bring all my love and tenderness with them! Good night, my precious, can’t wait to see you tomorrow! I want to be a cool breeze in the darkness of night that gives you goose bumps till you sleep. Good night. I would like to hear the word “Love“, such gentle and quiet, to hug you and fall asleep near you. Have sweet dreams. I wish to come quietly to you and wish you sweet dreams. And you are not here! I will smile again because we will meet. Before I fall asleep I would like to see you, I would like to see that warmth in your eyes which makes me feel so good. I want to feel your body and the warmth of your hands. I would like to feel tenderness and sweetness of your lips…. Sleep well. Feel the sweetness of the kiss…. sweet dreams. There you will see me, have sweet dreams! The sun sets in the west, the sunbeam hides on the bed sheets. The moon shines in the sky and the moonlight reflects in your eyes. The dream falls from the stars and covers you with sweet sleep. I have just had a telephone call from Inspector Dream, his surname is Goodnight. He told me, that all nightmares are arrested and detained. So you can sleep well…. Good night. Lie down slowly to your bed, close your eyes and think of nothing. And when you feel that you are in a dream, look around, maybe you will meet me there? As the moon sings lullaby and the stars kiss your eyes, I wish you sweet dreams, honey. The night is quietly coming and knocking at your door. And gently saying „Good night“. But more by you, my sweetie pie. Give you a hot hug and kiss you very gently. If I were night, I would close your eyes. But I will be a dream and I am coming to you. And whispering “I love you”. Bringing a handful of colourful dreams. Where you will see a lovely dream. Good night to you, my beautiful queen! While I cannot be near. I wish I could turn into a night butterfly tonight and fly through your open window to say “Good night”. I pick up the most beautiful one and give it to you!